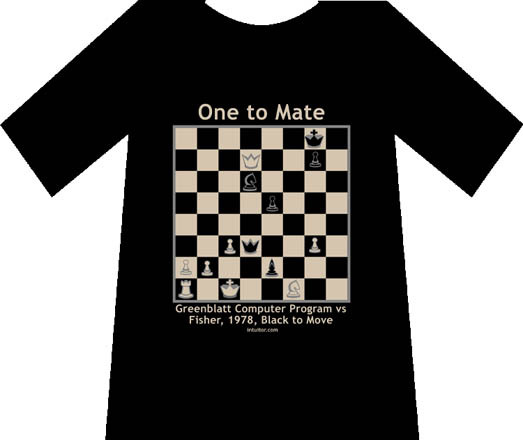 Although there are many excellent reasons to study chess, Intuitor.com considers studying chess the best way to explore the generic elements of strategy. These elements are common to martial arts, military, business, and political strategy. Oddly, strategy is not treated as a separate discipline such as mathematics. The closest academic subjects are game theory and strategic management. Typically students have to wait until graduate school to take a course in these subjects. Chess is about the only means of introducing the formal study of strategy earlier. Whenever possible Intuitor.com will attempt to illuminate the generic elements of strategy by comparing chess strategy to areas of real life. Definition: Strategy is the flexible plan for gaining control over opponent(s) and situations preventing the attainment of a goal or objective. Effective strategy compels a person's opponent(s) to act in ways which assist the person in attaining his or her goals. Whether used in chess, martial arts, business, or some other area, strategy is primarily focused on the opponent and has to be fluid because opponents often don't respond as expected. Strategy tends to be long-term in its implementation and consist of gaining many small advantages. At the start of the game each player has a latent strength of 39. This, of course, declines as the game proceeds. To be meaningful, latent strength has to be evaluated at the end of each round of play. A round is completed after both players have moved. The player making the first move in a round is a move ahead of his opponent. If a piece is captured during a round's first move latent strength will give a false indication of advantage. The opponent has to be given the chance to answer the attack. Latent strength tends to remain nearly equal for both armies throughout the first half of a chess match. Eventually one player begins to fall behind, usually by only one or two pawns. Even this small difference is significant and is a strong indication of who will win. The gap tends to widen with the weaker player eventually losing. Latent strength can be deceptive if powerful pieces are trapped behind others. This happens to the rook at the beginning of the game when it is trapped behind a pawn. Even if the pawn is moved forward two spaces, it takes the rook two moves to gain a position where it can use its considerable strength. These moves can be easily blocked by a bishop and hence are wasted. Latent strength does not measure the dynamic nature of a piece's strength. At Intuitor.com we refer to a piece's dynamic strength as its influence. A piece's influence is measured by the number of squares it can control. This includes any square where the piece can legally move or capture as well as the square the piece resides on. For example, figure 1 shows that a queen located near the center of an empty chess board can move to 27 different squares. Including the square where the queen resides gives an influence level of 28. 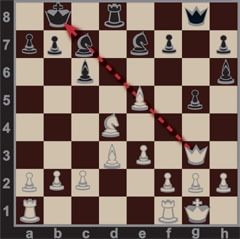 Locate the same queen on a crowded chess board as shown in figure 2 and the influence drops to 3 as shown for the black queen. Move the queen one square forward as shown for the white queen and the influence becomes 6. The Battle of Agincourt in 1415 is a good example of the difference between latent strength and influence. This battle was depicted in Shakespeare's famous play Henry V. In the battle a band of 6,000 lightly-armored Englishmen faced off against 25,000 heavily-armored Frenchmen. However, the English not only won the battle but virtually slaughtered the French. The French became tightly packed together and virtually immobile when they engaged the English. This happened due to a combination of mud, the weight of their armor, and battlefield disarray. As a result, the French could barely swing their weapons. Their considerable latent strength had little influence over the battle's outcome. In chess, the influence of the winner's army tends to increase for almost the entire game. The influence of the loser's army increases at first but then declines about half way through the game. Influence level can generally predict a winner at least two to three rounds before it's predicted by latent strength levels. A significant early lead in influence level within the first ten rounds is generally a bad sign. The player with the early lead often loses. This is analogous to the business world where expanding a growing business too fast often ends in disaster. High early influence is often caused by developing powerful pieces like the queen too early. They can be threatened by weaker pieces and forced to retreat. A retreat is like losing a move. In chess, influence level can be used as an evaluation tool when faced with the prospect of making an even exchange of pieces. If the exchange results in an influence advantage it is usually worthwhile. At first glance a chess board appears devoid of any features which could aid or inhibit an attacking army. However, this is not the case. If we evaluate the influence of a piece on each square of an empty board, a pattern emerges. Figure 2 shows an evaluation of this type for a bishop. It clearly illustrates that the bishop is more powerful in the center of the board. Figures 3 and 5 illustrate this same evaluation for a rook and knight respectively. Only the rook is unaffected by board location. 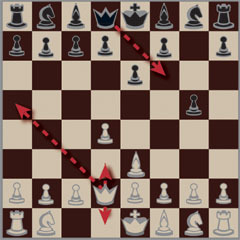 Figure 4 illustrates that the queen is a composite of the rook and bishop. Figure 6 is a composite of figures 2 through 5 and clearly illustrates that the center is the most powerful place to locate pieces. The four corners are the safest places to locate the king since they are the least accessible squares on the board. Obviously, the picture would be altered by placing multiple pieces on the board, however, the center is still generally considered an important area to control. In politics as in chess, the center is generally the strongest position. Politicians who stray too far from the center tend to lose elections. Definition: Tactics are powerful actions used to implement strategy. For instance, moving a piece would not be considered a tactic. Moving a piece so that it places an opponent's king in check and forces him to make an undesirable (to the opponent) move is a tactic. Chess tactics are usually implemented in the short term and focus on gaining latent strength or influence level advantage. For the intermediate-level player a firm grasp of tactics is the key to success. There are many different tactics to study. Three of the most powerful generic tactics are listed below. The Fork: A fork occurs when a single piece attacks two targets simultaneously. 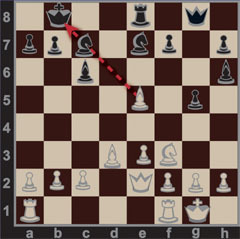 In figure 7 when the white pawn moves from e1 to e4 it forks the black knight and bishop on d5 and f5 respectively. This is a devastating blow since there is no way to escape the loss of one of these pieces. Forks are primarily effective when a weaker piece forks stronger pieces. 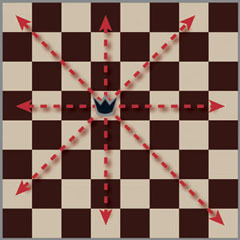 They are most effective when one of the pieces is a king as shown in figure 8. This not only results in the loss of an opponent's piece but also causes him to waste a move in order to remove his king from check. The martial art Taijiquan, or Tai Chi Chuan, has a number of fork moves imbedded in its forms. It's a deceptively effective martial art to the extent that many of the people practicing its forms do not even realize it can be used for self defense. The forms are practiced in a very slow dance-like manner with graceful movements with flowery names, such as play the lute. If an aggressor steps toward a Taijiquan master and foolishly throws a punch at the master's stomach, the master can counter with play the lute. In this move the master would simultaneously trap the aggressor's arm in a joint lock and heel kick the aggressor's closest knee. To protect his knee the aggressor must move backward but this tightens the joint lock. To release the joint lock he must move forward but this makes his knee vulnerable. In short, the aggressor is going to lose no matter what he does. The Pin: A pin occurs when a piece attacks another in such a way that the threatened piece cannot move without jeopardizing a more important piece. The pinned piece's influence is nullified for the duration of the pin. 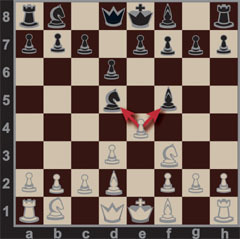 Figure 9 shows a white bishop pinning a black knight against its king. The knight cannot legally be moved from this position. The Doolittle attack on Japan during WWII is a good example of a pin tactic. In the raid Doolittle launched 16 B-25 bombers from the aircraft carrier Hornet several hundred miles off the coast of Japan. The bombs subsequently dropped on Japan did little physical damage but had enormous emotional impact. The Japanese military was highly embarrassed and resolved to protect the emperor from future attacks. This threat effectively pinned additional military forces and equipment in Japan. These were forces which would otherwise have been used in the battlefield. Combinations: In a combination, two or more pieces focus their power on one or more key squares. Combinations are difficult to defend against and are often used in the middle and end games. Figure 10 shows how the pin in figure 9 could be converted into a combination using both the white queen and bishop. 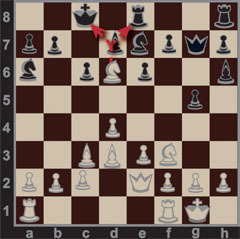 In this example, by using a combination the black knight can not only be pinned but captured with complete immunity. The king cannot move into check and so can not retaliate against the white bishop if it captures the black knight. Chess Instructions for Beginners: This instruction set is provided by Intuitor.com especially for beginners. Forchess: Free instructions for a popular chess variant with four-handed play. Yes, Insultingly Stupid Movie Physics (ISMP) is now in print with lots of new content not available on the web site. and many more topics in the ISMP book. Click here for more information. � 1996-2008 by T. K. Rogers, all rights reserved. No part of this webpage can be reproduced in any form, electronic or otherwise, without the express written approval of T. K. Rogers. Forchess is a registered trademark.